Hawking was a pop culture icon in so many ways. Stephen Hawking famously made high-minded theoretical physics palatable to the masses, and for that, people all over the world continue to revere the man as the icon he’ll forever be remembered as. And we’ll all still delight in seeing the many appearances he’s made on television over the years. Early Wednesday morning, Stephen Hawking died peacefully at the age of 76 at his home in Cambridge, England. Hawking suffered from ALS — commonly called Lou Gehrig’s disease — for decades. The progressive disease gradually erodes all muscle control in the afflicted person. As such, Hawking utilized a computerized synthetic voice for many years, a voice that became inseparable from his visage on television, even in cartoons. Over the many years that Hawking spent as a pop culture icon and revered scientist, he made numerous appearances on various television programs, most often those heavy on the science fiction. 'Big Bang Theory' loved its nerdy celeb cameos, and Stephen Hawking's was an absolute treasure. Stephen Hawking hosted a truly “stellar” educational mini-series all about aliens, time travel, and humanity’s place in the universe. It’s the perfect distillation of exactly how Hawking was able to make his impossible complex theories comprehensible to the masses while also making the science so compelling. The intro sequence for the show also offers a heartwarming look at Hawking’s optimism in the face of the disease that radically changed his life. 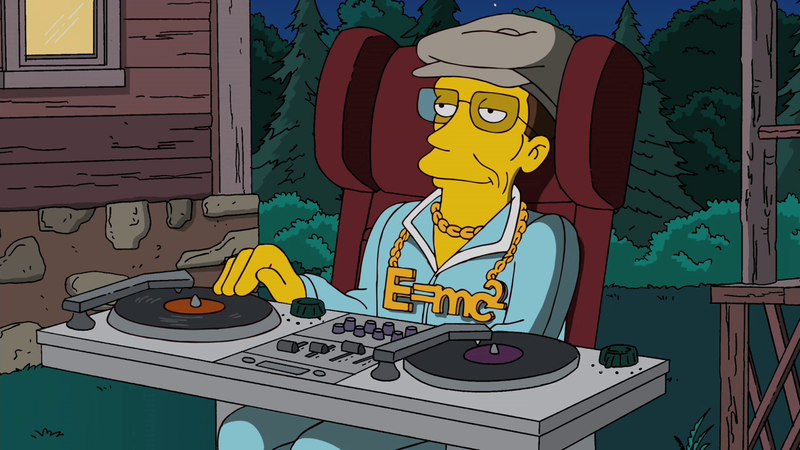 Stephen Hawking made regular appearances on 'The Simpsons' for many years. Hawking first appeared on The Simpsons in 1999 in “They Saved Lisa’s Brain” and used an Inspector Gadget-style wheelchair to protect Lisa from Springfield’s Mensa chapter. It began a long history with the show that continued for many years. Series creator Matt Groening even presented Hawking with a toy version of his character in yellow-skinned animated form at the 2004 British Comedy Awards. Hawking later reappeared for more cameos in Seasons 16, 18, and 22 but not even rapping with Flight of the Conchords could top his first performance. Vice Presidential Action Rangers is a hilarious group of space-time protectors on 'Futurama'. 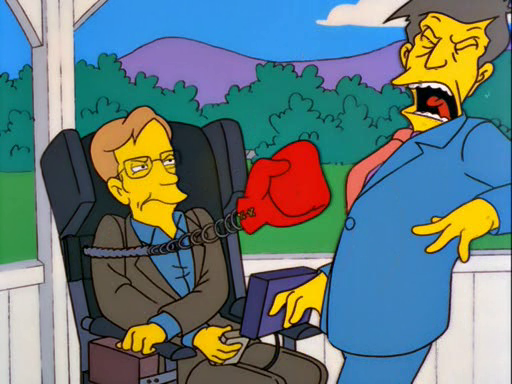 He might’ve been a welcome addition to Springfield every time he appeared, but Stephen Hawking was arguably even more fun every time he graced Futurama with his presence. In the film The Beast with a Billion Backs, Hawking appeared as a head in a glass jar, which was customary for most celebrity guests on Futurama. But Hawking’s memorable first appearance in “Anthology of Interest I” was as a member of a team guarding the space-time continuum that included the likes of Al Gore, Nichelle Nichols, and Gary Gygax. Data plays poker with Einsten, Hawking, and Newton in 'Star Trek: The Next Generation'. In one of Stephen Hawking’s absolute best appearances on television, he was one of the only people to ever play himself on Star Trek. 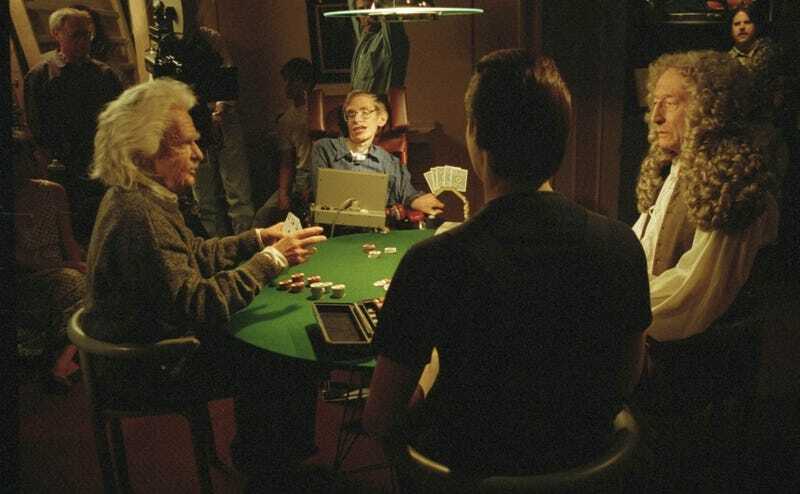 During the Season 6 episode “Descent,” the android Data plays poker against holographic recreations of Sir Isaac Newton, Albert Einstein, and Stephen Hawking. Obviously the real Newton and Einstein weren’t around to play themselves in hologram form, making Hawking’s appearance one for the ages.